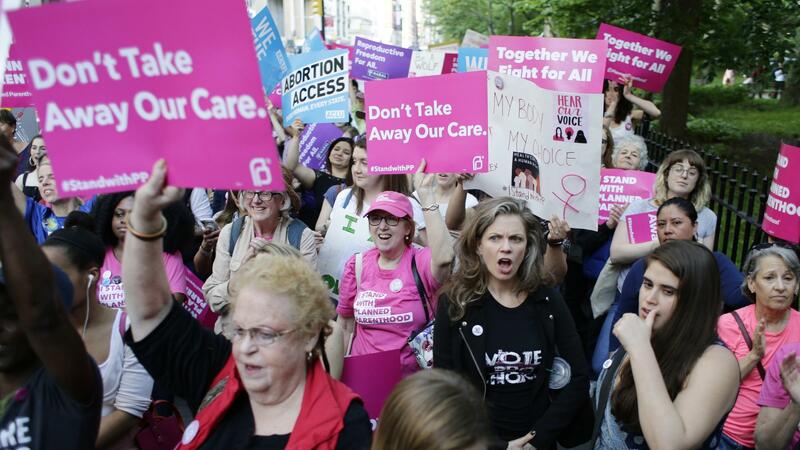 Supporters of Planned Parenthood react to speakers at a rally in New York in May. Planned Parenthood Federation of America told NPR on Thursday it will be joining officials in a growing number of states to oppose a Trump administration proposal to withhold federal funds from family planning clinics that provide information about or refer women seeking an abortion. In a draft press release given to NPR, Planned Parenthood said, "By conditioning funds on restrictions that are fundamentally at odds with the professional and ethical obligations of health care professionals, the Department will give many grantees and health care professionals no choice but to withdraw from Title X." The organization serves more than 1 1/2 million Title X patients around the country. "We will resist this rule with everything we have," Gov. Jay Inslee of Washington state told NPR. "We will not be complicit with Donald Trump on this. This is a barbarous policy to prevent women from getting access to health care." The proposed changes are to the Title X program, which provides financial support for more than 4 million low-income women to get primary and preventive health services. In a notice of proposed rule-making published on June 1, the U.S. Department of Health and Human Services proposed the following rule change: "A Title X project may not perform, promote, refer for, or support, abortion as a method of family planning, nor take any other affirmative action to assist a patient to secure such an abortion." The goal is to establish a firewall of separation between taxpayers and health care providers who might provide abortion information to women. Critics call the proposed changes a "gag rule" and vow to drop out of the Title X program altogether rather than participate in what they describe as unethical interference between health care providers and their patients. On Monday, attorneys general of 13 states sent a letter to Health and Human Services Secretary Alex Azar. The letter said if the rule is finalized, Title X recipients will be forced into the "untenable position of deciding whether to accept program funds with mandates that restrict access to care and force a gag on clinics" or give up Title X funding altogether. The latter would result in a cut in funding available to family planning providers, "thereby reducing critical healthcare services available to vulnerable populations. Either decision will lead to serious public health threats, increased risk of unintended pregnancies, and gaps in care." In June, the National Association of Community Health Care Centers weighed in, saying, "Should this proposed rule be adopted, health centers would have to choose between allowing federal regulations to dictate what they can and must discuss with their patients, and using a critical source of revenue to support patient care. Either way patients would not be well-served." The attorneys general, from mostly Democratic states around the country, vowed to oppose the administration's new rules in court.